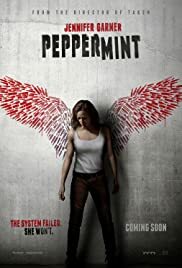 Here is “Pepermint” trailer with English and French subtitles. and peppermint in her blood. but they are all linked to the Garcia Cartel. No witness has been willing to step up. These cartels are no joke. They got everyone in their pockets. You’ve been through a terrible tragedy. Maybe you didn’t see what you think you saw. Maybe you’ve made a mistake. Is it possible that your recollection isn’t what you thought it was? to hold the defendants over for trial. You think that’s you’re gonna have, “justice”? Five years ago Riley North just disappeared. So she spent the last five years doing what? You honestly think Riley North did this? Today is the five-year anniversary of her family’s murder. That’s not a coincidence that makes this area low crime. It is low crime because of her. At least somebody is doing something. I don’t care if you have to burn the city down. it turns you into somebody else. Social media is lit up with support for her. She’s a multiple homicide suspect. Not to them she’s not. how you really think this is gonna go? I will kill everyone of you. and the I’ll pretty much wing it from there. Voici la bande-annonce de “Pepermint” sous-titrée en anglais et en français. et de la menthe coule dans ses veines. mais ils sont liés au cartel de Garcia. Aucun témoin ne s’est manifesté. Ces cartels ne rigolent pas. Ils contrôlent tout le monde. Vous avez vécu une tragédie. Vos yeux vous ont peut-être trahie. pour qu’un procès se tienne. Vous croyez que “justice sera rendue” ? Qu’ils vont “tous payer” ? Il y a cinq ans, Riley North a disparu. Qu’a-t-elle fait ces cinq dernières ? Tu crois vraiment que Riley North a fait ça ? C’est le 5e anniversaire de l’assassinat de sa famille. Au moins, quelqu’un fait quelque chose. Quitte à raser la ville. comment crois-tu que ça va se terminer ?